EVGA NU Audio Card Review - Legit ReviewsDo you need a sound card for your PC? Do you need a sound card for your PC? EVGA has teamed up with the audiophiles over at Audio Note to create the EVGA NU Audio Card. The add-in sound card business is a new product segment for EVGA and one that isn’t flooded with a ton of options. For a number of years now gamers have turned to the Sound Blaster series from Creative Labs and Xonar series cards from ASUS for improved audio. A quick look at the Amazon Best Sellers for internal PC sound cards show that these two companies are behind 8 of the 10 best selling models at the time of writing. So, why let two companies have all the fun? EVGA co-founder Andrew Han is a huge audiophile and a long time friend of Andy Grove who just happens to be the designer in chief over at Audio Note (UK). Over the years the two have talked about teaming up to create a series of high-end sound cards for the PC market to provide the most immersive audio and lifelike gaming experience possible. Audio Note (UK) is a super high-end audio company that makes some of the most expensive audio equipment on the market today. Therefore when we found out that the EVGA NU Audio card carries an MSRP of $249.99 ($199.99 for EVGA ELITE Members) we weren’t too shocked. None of the top 10 best selling sound cards on Amazon are over $130 and this $249 card is expected to be the base model for EVGA. How does EVGA justify the $249 price tag? AudioNote designed the NU Audio sound card to have a solid hardware foundation and started off by using a six-layer, gold-plated PCB. From there the heart of NU Audio would be the XMOS xCORE-200 DSP (USB controller) that is bridged to the PCI Express interface with an ASMedia ASM1042 host controller. The designers went with Nichicon solid-state capacitors and audio-grade resistors as well as a Texas Instruments TPS7A47/TPS7A33 power-regulation circuit. The NU Audio also has German-made WIMA capacitors, AKM 4493 DAC and AKM 5572 ADC. When it comes to OP-AMP selections a ADI OP275 was used for the headphones and an ADI AD8056 was used for the line out. All that is topped off with a modern stylized metal shroud that features customizable RGB lighting. The end result is an audio card that has a Dynamic Range (DNR) and Signal to Noise (SNR) of 123dB for stereo playback and 121dB for line-in recording. You also have support for a wide range of playback formats including DSD up to x256. Do you know about DSD (Direct Stream Digital)? DSD is the encoding format for Super Audio CD (SACD) and the EVGA NU Audio is said to be the only add-in card for the PC market capable of natively playing them at this price point. The EVGA NU Audio card comes with a 6.35mm to 3.5mm jack adapter as well as an RCA to 3.5mm jack adapter, so you shouldn’t have to buy anything to use it. When it comes to inputs and outputs the external I/O arrangement on the EVGA NU Audio should cover most folks. You have a 6.3mm headphone output, 3.5mm line and microphone inputs, dual RCA (L&R) outputs and finally the S/PDIF out. The SATA power connector is located on the end of the card and the front panel audio header is located on the top of the card. This makes cable management a bit tricky especially if you have a video card with axial fans. The EVGA NU Audio uses 8 Watts of power delivered from the SATA header to ensure the audio isn’t interfered with. Here is a quick look at what is under the cover. You can see the copper shielding cover to the left of the SATA power connector that reduces EMI and other features of the card with the cover off. Installation is a breeze as you just need to install it in any open PCIe slot, connect it to an available SATA power cable on your PSU and install the driver provided by EVGA. The driver is just over 6MB and the EVGA NU Audio software utility is simple to use. 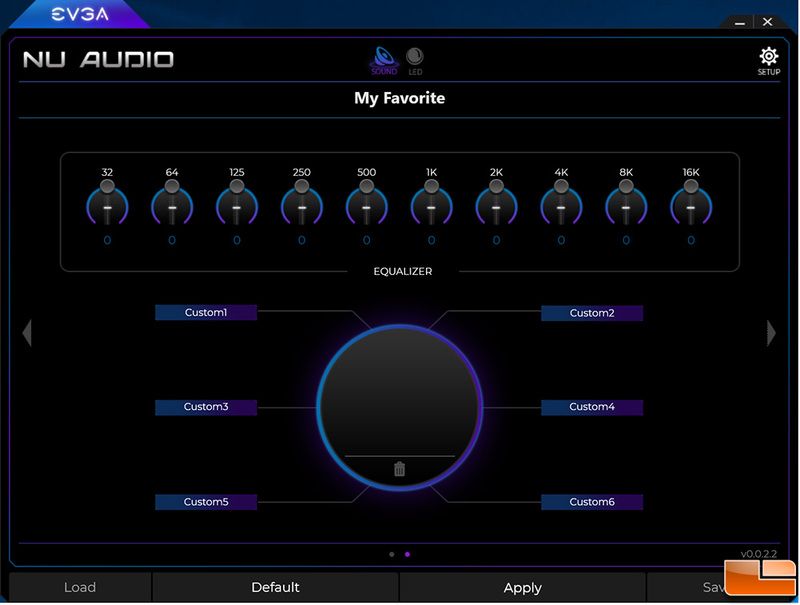 On the main menu you can adjust input and output volume / level controls. You can also change the headphone volume separately from the master volume, which is nice. The sample rate can be set with the base being 16-bit, 44100 and the max being 32-bit 384000. 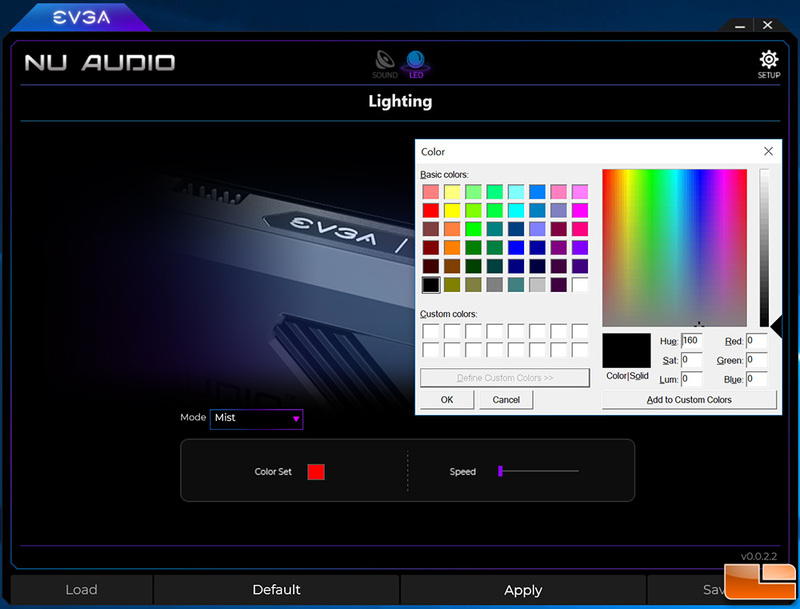 The look and feel of the GUI should be familiar to anyone that has used EVGA’s Precision X1 utility for graphics cards. If you arrow over to the next menu option you’ll find the utilities 10-band equalizer. This allows end users to adjust the frequency levels for 32Hz to 16KHz range and then save them to one of six available preset locations. Lastly, there is the RGB lighting control menu that allows you to set the color of the top display and then the lighting effect mode. The lighting modes include popular settings like pulse, mist, solid, rainbow and so on. This product won’t be appealing to all of our readers as it is really aimed at audiophiles that are willing to drop money on high-end headphones. 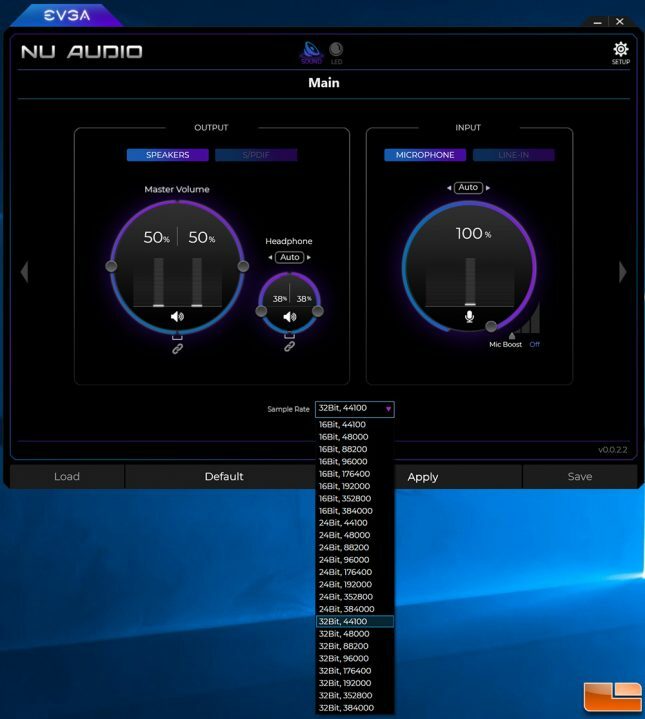 If you have a pair of high-end headphones and are looking to replace your external DAC/AMP to clean up the desktop, the NU Audio might be right for you. So, at the start of this article we asked if you need it? The answer is clearly no for those happy with integrated audio solutions, but the answer is possibly for the discerning audiophile. Many audiophiles are also looking to upgrade older sound cards as some of the older models lack official driver support in Windows 10, so the NU Audio card might be just what you are looking for. 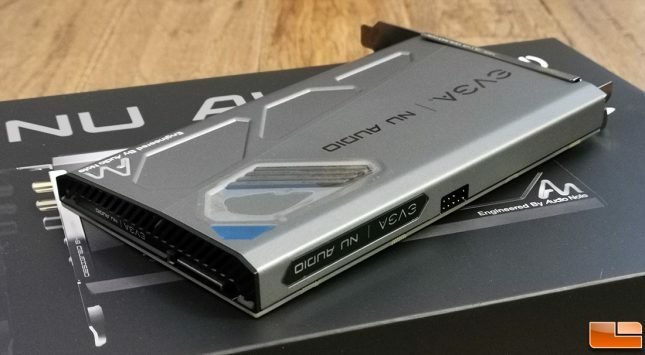 Right now EVGA is marketing this card as offering a “lifelike audio experience” and after using the NU AUDIO for several days we were impressed with what we heard. Our subjective testing consisted of using the on-board audio on the Gigabyte Z370 AORUS Gaming 7 motherboard (121dB SNR AORUS AMP-UP Audio with ALC1220 & High-End ESS SABRE 9018 DAC with WIMA audio capacitors). This Intel Z370 motherboard is available for around $235 and is what we’d consider a mainstream gaming platform with a solid audio solution. 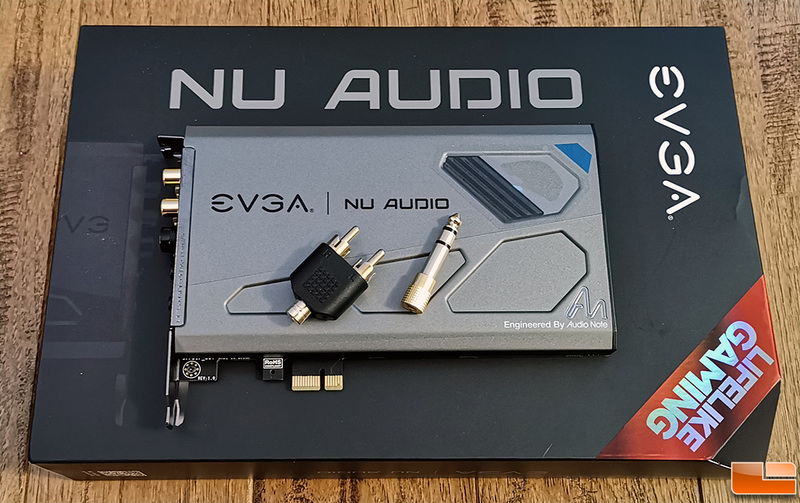 The audio quality on this board has been ‘good enough’ for us, so we were really excited to see what the EVGA NU Audio could offer as it is more than the price of this motherboard. We noticed that sounds were crisper and more easily distinguishable in music (especially on the EVGA provided audio samples), but games sounded just as good as they always have. We did our testing on a Corsair Gaming Audio Series SP2500 High-Power 2.1 Speaker system from 2011 as well as a pair of Kingston HyperX Cloud Revolver S gaming headset ($122). These two audio solutions are aimed at gamers and aren’t super high-end solutions and subjective testing is all that we are capable of doing here. That might have impacted our experience. It should also be noted that EVGA has informed us that more features and functionality will be coming to the driver. Some of the improvements will include improved Virtual Surround support (for supporting games and Windows Sonic), EQ Presets and more. If you are on the fence about buying the EVGA NU Audio card we’ll leave you with this. EVGA will have a program where they will be offering a 100 EVGA Bucks guarantee to those that are buying this card. 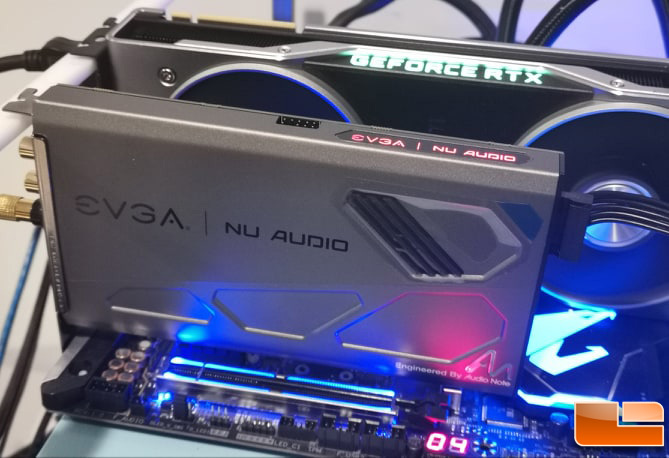 That 100 EVGA Bucks guarantee is that you will be able to hear a noticeable difference between your current sound solution and the EVGA NU Audio Card. 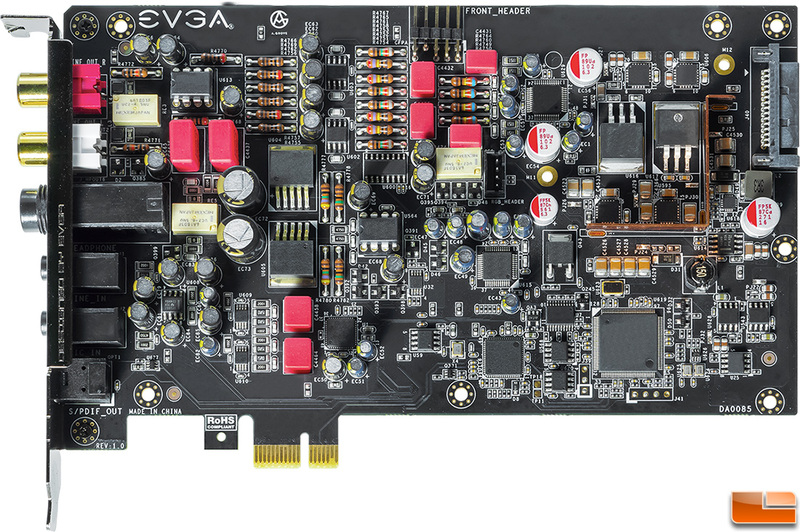 Legit Bottom Line: The EVGA NU Audio add-in sound card is clearly aimed at audiophiles that are looking for something better than on-board sound that have high-end audio equipment to be able to get the most from a solution like this. Our mainstream gaming audio equipment was likely limiting our audio immersion with the Nu Audio.